Many investors see Africa as the "final frontier" as emerging markets like China and India continue to mature. With a population of about a billion and significant natural resources, the continent has been growing in popularity among investors over the decades. But, the region has also been devastated by war and regime changes that have kept many multinational companies and investors away. Invest in Africa: North, South or In-Between? Unlike Europe or South America, investing in Africa varies quite a bit by region. Northern Africa is very similar to much of the Middle East in terms of its oil assets and major industries, while South Africa is considered a more developed market with a strong mining industry. Sub-Saharan Africa is still widely unavailable to international investors and includes lesser developed economies. South Africa represents the most popular way to invest in Africa. Driven largely by raw materials and mining, the country is the largest producer of gold, platinum, and chromium in the world. However, the country's agricultural and banking sectors are also fairly sizable and its consumer class is slowly reducing reliance on exports and fueling domestic services growth. Northern Africa consists of Algeria, Egypt, Libya, Mauritania, Morocco, Tunisia, and Western Sahara. Many of these countries are known for their extensive crude oil reserves. For instance, Libya holds Africa's largest oil reserves and the eighth largest reserves in the world. Over ten percent of all crude oil imported into Europe comes from Libya. Multinational companies have stakes in many of these oil reserves, although politics frequently interferes with operations. The easiest way to invest in Africa is through exchange-traded funds (ETFs) and mutual funds. Not only are these funds traded on U.S. stock exchanges, they also contain built-in diversification and cost far less than manually building a portfolio with American Depositary Receipts (ADRs) or foreign stocks that trade on foreign stock exchanges. The most popular South African ETF is the MSCI South Africa Index Fund (NYSE: EZA), which represents the only pure play to invest in the country. However, the SPDR S&P Middle East & Africa ETF (NYSE: GAF) also has more than 80 percent exposure to the country, which makes it a more diversified play on the country and region. Since the rest of Africa isn't quite as popular, there are only a few broad options to invest in the region. The first option is to purchase Middle Eastern and Frontier Market ETFs that include exposure to African countries. 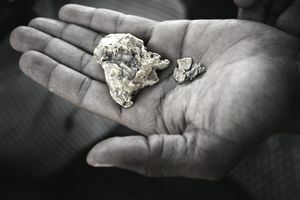 Since many African countries have enormous natural resources, the second option is to invest in commodity ETFs, like those focused on copper and gold. Africa offers the highest return on foreign direct investment in the world, according to the Overseas Private Investment Corporation (OPIC) and UNCTAD. But, there are also many unique risks faced by those that invest in Africa. From civil wars to political risk, companies face a number of hurdles competing in the region's promising economies. Natural Resources: Africa has an enormous amount of natural resources, ranging from oil and diamonds to gold and uranium. And many of these natural resources remain untapped due to a low human density along with a lack of infrastructure and financing. Large Population: Africa's population represents approximately 14.72% of the world's total population with about a billion inhabitants in more than 60 territories. This creates a huge opportunity for consumer goods, such as telecommunications and banking. Relatively Undeveloped: Africa remains relatively undeveloped with per capita income that lags the rest of the world. This means that there may be enormous opportunity for growth in the future as its population grows and becomes more wealthy. Governmental Problems: Some governments in Africa are known for their corruption or lack of policy. Corruption can lead to a number of problems, ranging from extortion to nationalizations, while the lack of policy can make it complicated to do business. Lack of Infrastructure: Africa has a low human density and per capita income, which contributes to its lack of infrastructure. This makes it difficult for companies to get the electricity, roadways and other necessary components to operate in some areas. Regional Conflicts: Africa is well known for its civil wars and conflicts, which have taken a toll on its population. Regime change can also be very difficult for companies, since it causes a great amount of uncertainty. Investors should carefully weigh the benefits and risks of investing in Africa before taking any positions. In general, it's a good idea to only allocate a small percentage of assets to riskier regions, like Africa, to maximize risk-adjusted returns. Should You Invest in South Korea? Which Emerging Markets Are Making an Impression With Investors?